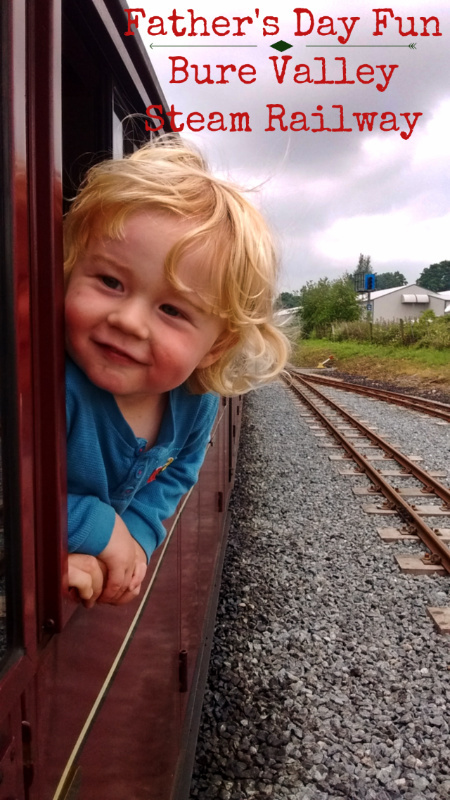 The TWT family are suckers for a train, especially a steam train and the Bure Valley Railway has stolen our hearts on the couple of occasions we’ve been on it. I’m not sure what it is. The route isn’t anything special, there are no spectacular views. The café and shops at the Aylsham end do everything you would expect them to. They serve lunch and train related souvenirs. There’s just something brilliant about the sense of excitement you get when you take a child (plus some big children) on a steam train. The railway is run on a not for profit basis mostly by volunteers who give up their time for the love of the trains. The original railway line opened in 1880 and survived 100 years, finally closing to freight traffic in 1982. Luckily Norfolk County Council preserved old railway lines for use as footpaths so the route remained in tact. A narrow gauge line was built along side a 9 mile stretch of footpath and the Bure Valley Railway was opened to the public in 1990. The trains which run on the line are 15 inch guage steam trains. Each compartment in the comfortable coaches is plenty big enough to seat our family of four and we can tuck the pushchair neatly under the seats. The route takes you from Wroxham in Norfolk to Aylsham stopping at a few small stations on the way. It takes about 45 minutes to get from one end to the other. Or you can take your time and walk some sections between stations. Although the railway is very near to the Norfolk Broads you will find yourself chugging along through rolling East Anglian farmland and crossing country lanes. At Aylsham Station there is a decent café and gift shop to keep hungry small people fed and supplied with train related memorabilia. There are also several model railways dotted around the place to keep them entertained. We have never left the station area so I can’t comment on the delights of Aylsham. We find there’s just enough time to have some food and look round everything before the return journey. Where is the Bure Valley Railway? I’ve mentioned the town of Wroxham before in a previous blog post. It’s a compact tourist town, the gateway to the Norfolk Broads! The Bure Valley Railway is a short walk out of town and has its own car park. We’ve always been at weekends and it has never been overcrowded. It’s worth checking out their special events page. The first time we went we booked advance tickets for father’s day. The tickets included the chance for David and his father to both drive the train for a short distance out of Aylsham Station and back again. I have never seen two grown men so giddy. It was a wonderful experience. Where’s your favourite steam train?